The EUR/USD is under some selling pressure today after yesterday’s rally fueled by U.S. Prelim GDP data failed to overcome 10/27 highs, let alone our 1st tier downtrend line. Additionally, yesterday’s buy-side volume came in well below Tuesday’s pop in sell-side activity. As a result, a negative investor sentiment remains in regards to the performance of riskier investment vehicles. The AUD/USD, Cable, and gold are also heading south while the USD/JPY trades higher, indicating a broad-based preference for the Dollar. Although yesterday’s better than expected U.S. Prelim GDP data fueled a risk rally, the bulls were unable to gather enough momentum to overcome topside technical barriers across markets. The Cable’s rally in reaction to yesterday’s positive U.S. Prelim GDP has hit a wall at our 2nd tier downtrend line. As with the EUR/USD, the GBP/USD failed to receive any abnormal topside volume yesterday, indicating bulls weren’t fully behind the risk rally. The lack of topside conviction likely stems from the disappointing U.S. Unemployment Claims number which was overshadowed by optimism surrounding GDP data. Furthermore, Britain released an HPI number today which printed three basis points below expectations and five lower than its previous release. The impressive recovery in Britain’s housing market has been at the heart of the nation’s broader economic stability. Therefore, any week housing data carries a little extra weight in Britain. Regardless, the Pound continues to enjoy its relative strength, as exhibited by the large pullback in the EUR/GBP. Despite today’s HPI number and last Friday’s disappointing GDP data, Britain’s forward looking econ data has been printing positive. Therefore, Sterling investors are taking a wait and see approach to analyze not only what Britain’s Q4 performance looks like, but also how the BoE stands in regards to upcoming monetary policy. A selloff is taking place in the riskier FX pairs and the USD/JPY is following suit, telling us investors prefer the Yen over the Dollar as a safe haven right now. Today’s strength in the Yen also stems from the BoJ’s decision to end a couple of its bond purchasing programs in an effort to tighten liquidity. Today’s monetary policy falls in line with the BoJ’s more conservative stance since the DPJ took office. Furthermore, the BoJ was likely encouraged by the USD/JPY’s recent solid performance above its important 90 threshold. However, today’s larger than expected decline in both the Tokyo Core CPI and Household Spending tell us the BoJ can’t be too conservative with its monetary policy since deflationary pressures are still bearing down on consumer prices. Additionally, even though this week’s Industrial Production number printed better than analyst expectations, the 1.4% rate of growth is unsubstantial compared to the huge declines we witnessed during late 2008/early 2009. Hence, Japan’s economy still faces a long path to recovery. Gold had a nice little pop yesterday as investors exited the Dollar in reaction to stronger than expected U.S. Prelim GDP data. However, as with the EUR/USD and GBP/USD, gold’s positive momentum fell short of important topside technical barriers, mostly notably $1050/oz and our 3rd tier uptrend line. Investors are now exiting their risk trades today as optimism wanes in the face of negatively mixed data. The S&P futures are also trading off by over -1% and crude over -2%. Gold is following its positive correlations to a tee today and is heading back below our 2nd tier uptrend line. Hence, markets are showing us that investor uncertainty is outweighing optimism. The positive Q3 earnings season has been priced in, and investors are now looking towards Q4 fundamental economic performance. Yesterday’s rally fueled by better than expected Prelim GDP data has almost been erased and the futures are trading back below the psychological 1050 level. Investors are slamming U.S. equities again after Personal Spending and the Core PCE Price Index both came in below analyst expectations. On a positive note, today’s Chicago PMI headed over 50, registering expansion (50+) for the first time since September 2008. Hence, manufacturing continues to benefit from the Dollar’s recent round of depreciation. However, investors should keep in mind that this week’s economic data has been very weak overall. Placing yesterday Prelim GDP number aside, we received weaker than expected unemployment, spending, housing, durable goods, and consumer sentiment data this week. Hence, the path to recovery is riddled with speed bumps, providing investors with enough incentive to take profits and place a downward pressure on equities. The sore thumb continues to be the U.S. Unemployment Rate. The decline in Unemployment Claims has been agonizingly slow and is leveling off again. The high level of unemployment is clearly weighing on consumer sentiment and consequently personal spending. Meanwhile, investors are a bit concerned that some central banks will tighten their liquidity too quickly and choke the global economic recovery. After all, economic data has been mixed, and despite the positive Q3 earnings season we have yet to see how corporations can perform once stimulus measures wear off. The U.S. will kick off next week with ISM Manufacturing PMI and Pending Home Sales releases. The Fed will also make a monetary policy decision on Wednesday, meaning present volatility should carry over into next week. 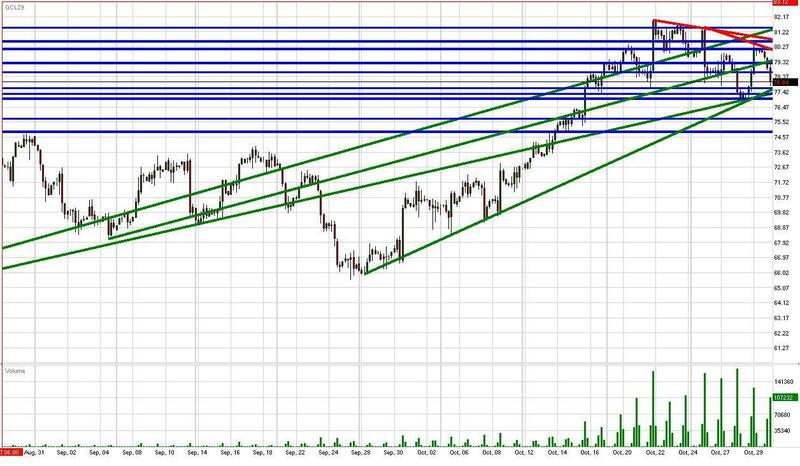 Technically speaking, yesterday’s rally was unable to overstep any significant topside barriers. The futures are back below the psychological 1050 level and are testing Wednesday lows. Meanwhile, the futures are falling even further behind what is now our 2nd tier uptrend line. We’ve highlighted this trend line several times in the past since it runs through October lows. The S&P’s inability to get back above our 2nd tier uptrend line is a disconcerting sign, and indicates that the S&P futures may retrace towards October lows (1013) after all. That being said, October lows (1013-1020) serve as the next technical cushion along with the highly psychological 1000 level. As for the topside, the S&P face 1050 along with 10/27 highs and our new downtrend lines. Crude futures are trading back below the psychological $80/bbl again today after yesterday’s pop in reaction to the stronger than expected Prelim GDP data. The U.S. received another wave of negatively mixed economic data today to go along with yesterday’s overlooked higher than expected weekly Unemployment Claims reading. In all, unemployment continues to rise and the level of consumption and spending has been disappointing as a result. Low rates of consumer confidence and personal spending are taking a bite out of the expected aggregate demand for crude. Therefore, crude futures are getting hit today while following the S&P futures lower. The Dollar has naturally been a beneficiary of the growing negative investor sentiment as investors head towards the Greenback for safety. As a result, crude’s correlations are falling into line and serve as useful analysis tools. Hence, investors should monitor the EUR/USD’s interaction with Wednesday lows and our uptrend lines. Meanwhile, the S&P’s retracement below its Wednesday lows could signal a movement towards October lows along with the highly psychological 1000 level. Such a development would yield further weakness in crude. On the other hand, crude does have stronger near-term technical cushions than the S&P futures since crude has benefited from the rapid decline of the Dollar. As a result, crude has cushions standing nearby in the form of our 1st and 2nd tier uptrend lines along with 10/15 lows and the psychological $75/bbl. As for the topside, crude has to deal with the psychological $80/bbl and faces 10/29 highs along with our newly installed downtrend lines.